Chairman of the Economic and Financial Crimes Commission (EFCC), as Magu ressumed office on Wednesday, November 11, 2015. He succeeded Ibrahim Lamorde who held the post between November 28, 2011 and November 9, 2015. By the appointment, Magu became the fourth chief executive of the agency, after Nuhu Ribadu, Farida Waziri and Lamorde. Since November 11, 2015, when Mr. Ibrahim Mustafa Magu officially took over as the Acting Chairman of the Economic and Financial Crimes Commission, EFCC, indeed, President Muhammadu Buhari’s fight against corruption has continued to get the needed boost. In line with President Buhari’s famous punchline quote which says, “If Nigeria does not kill corruption, corruption would kill Nigeria,” Mr. President needed an anti-corruption czar whose team would definitely kill Corruption, a sad menace which had hitherto continued to eat into the fabrics of our society. True to one of his planks of electoral campaign promises in 2015, which was stamping out corruption, President Buhari in his eagle-eyes critically looked within the Nigerian Police Force, one name popped up to man Nigeria’s anti-corruption agency, the EFCC, and that was Magu. Ibrahim Magu, a Kanuri man from Borno State. In 1980, Magu graduated from the Government Secondary School in Waka-Biu, Borno State. Magu proceeded to the University of Maiduguri where he bagged a degree in Accountancy. Magu is now a certified accountant, a trained financial crimes investigator with background in forensic accounting. In 2005, to understand the ramifications and far-reaching impact of the effect of corruption, Magu enrolled at the University of Hong Kong and obtained a graduate certificate in corruption studies. Between 2010 and 2011, Magu earned a masters degree in law enforcement and criminal justice from his alma mater, ABU, Zaria. One of the hardest trails currently beclouded in Nigeria is that of tracing the terrorism financing flow. Against this backdrop, Magu attended anti money-laundering courses with the FBI, and anti-terrorism, combating the financing of terrorism courses with the US Department of Justice and the Department of Homeland Security. This background allows him to create a pathway in tracing the financial transactions meant for sponsoring terrorism-related activities. Magu onced served as head of the EFCC’s Economic Governance Unit (EGU) during the tenure of Nuhu Ribadu. Magu, while he worked with Ribadu, was said to have carried out the investigation that led to jailing his brother-in-law and former Bank of the North chief, Shettima Bulama. Though Bulama was later set free by former President Goodluck Jonathan. Magu was one of the first set of recruits into the EFCC by the pioneer chairman of the commission, Nuhu Ribadu. Magu is a member of the investigative committee convened by National Security Adviser (NSA), Babagana Monguno on the orders of President Muhammadu Buhari to probe the procurement of arms in the Armed Forces from 2007 till 2015. Magu gained recognition after aiding and leading many high profile investigations against former governors including James Ibori of Delta State, Lucky Igbinedion of Edo State, Peter Odili of Rivers State, current Senate President, Bukola Saraki, while he was Governor of Kwara State. 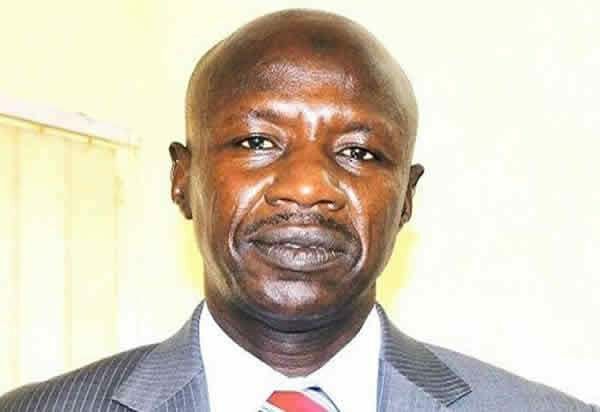 Magu was arrested on August 4, 2008 following allegations that police discovered EFCC files and a computer containing classified documents at his Abuja residence. He scaled that hurdle as he is today seen as an incorruptible and courageous cop. Magu was subsequently re-deployed to the police after days of detention with nothing incriminating found against him. Magu was later suspended from the police, going without salaries for several months. However, following his appointment as Chairman of the EFCC in 2011, Mr. Lamorde made the return of Mr. Magu to the EFCC a top priority. Both men had worked together at the commission when Mr. Lamorde served as head of operations of the agency. In a letter written to the Inspector General of Police (IGP) on March 19, 2012, and titled “Re: Postings/Transfer and secondments of police officers to the EFCC,” Mr. Lamorde put Mr. Magu as top on the list of police officers he wanted to be deployed to the EFCC. But when the police boss was to confirm the deployment of the officers, Mr. Magu’s name was conspicuously absent. Mr. Lamorde eventually had his way after President Goodluck Jonathan reportedly intervened in Mr. Magu’s case. Following the President’s intervention, Mr. Magu was released to the EFCC. Magu had remained a top official of the commission until he was appointed to succeed Mr. Lamorde. On assumption of office, Magu had called on all staff of EFCC to get positioned for a greater fight against corruption in Nigeria. Magu had insisted that with corruption, there would never be a meaningful development in Nigeria. Magu had affirmed that he had come to the EFCC to ginger up the anti-corruption campaign. Magu had vowed that there was the need to make sure that whatever was gotten for common use did not end up in private pockets. Magu had further called all staff of the EFCC to personally channel their grievances to him as he will be solely responsive to their welfare. Magu had said that he was ready and willing to work with everybody without any primordial concerns. Magu is no stranger to the operations, philosophy, ideals and objectives of the EFCC, being a pioneer staff of the Commission. Magu is a member of the elite corps of officers of the agency, an Assistant Commissioner of Police. Magu has held several leadership positions within and outside of the EFCC. Magu started his EFCC career as pioneer head of the Economic Governance Section of the Operations Department. That unit handles most of the high profile cases involving politically exposed persons. After his recall to the EFCC in 2011 by his predecessor, Ibrahim Lamorde, Magu was appointed deputy director in the newly created Department of Internal Affairs, saddled with the responsibility of enforcing discipline and ensuring that staffs exemplify the Commission’s core values of integrity, courage and professionalism in both their official conducts and private lives. Prior to coming to the EFCC, Magu served as member of the Nigerian Contingent to the United Nations Peace Keeping operations in Bosnia. Magu’s last assignment before receiving the nod of President Buhari to step in as acting EFCC chair was as a member of the investigative committee convened by the National Security Adviser, Babagana Monguno, to probe the procurement of arms in the Armed Forces between 2007 and 2015. For his indubitable anti-corruption posture, Magu has never been loved by current and ex-government officials. In 2011, when Lamorde as new EFCC chairman, requested that Magu be transferred back into the commission, politicians, led by some ex-governors fought against it. Magu is very strict as his services and records both in the Police and the EFCC record speak for him. Also, to Magu’s records is the prosecution and charging to court of Ayodele Fayose, the current governor of Ekiti state. Magu also led the investigation of Sen. Joshua Dariye, the former governor of Plateau state. Magu also investigated former Nasarawa state Governor, Abdullahi Adamu and Korean Yo Jim for the Farin Ruwa Hydro Electric Dam which became a white elephant project. Magu facilitated the charging to court of former Sokoto state governor, Alh. Attahiru Baffarawa on the alleged diversion of public funds. Similarly, Magu spearheaded the case against Boni Haruna, the former governor of Adamawa state. Magu was also at the forefront of building the case against Steph Edward Jason, Jim Bob Brown, then members of the Wilbros Group alleged to have given government officials gratification to win the Eastern Gas Gathering System. This investigation was conducted in collaboration with the US Justice Department and the FBI. One of Magu’s most famous cases has been the prosecution of and securing a subsequent jail term for his former boss, Inspector General of Police Tafa Balogun. Another equally high-profile case handled by Magu was that of Late Prince Abubakar Audu, the then-governor of Kogi state, who was charged to court on allegations of diverting N10 billion to purchase real estate assets abroad. Magu also led the investigation, prosecution and charge of Alfred Omoerah serving his 10-year prison term after forging customs duty clearance and defrauding the federal government of N214 million with the help of a staff in the then-accountant general’s office. All these cases and Magu’s famed no-nonsense mien earned him the appellation “the General” from his colleagues and subordinates at the anti-graft agency. Without much ado, Magu comes to the EFCC job with the requisite credentials and stem reputation to get the job done and decrease Nigeria’s perception as the bastion of financial crimes and mismanagement of resources. As it is with corruption, it will eventually fight back, but sincerely, Magu the “general” has gallantly led the war against corruption in Nigeria. Appointment of Acting Chairman of Economic and Financial Crimes Commission (EFCC), Ibrahim Magu. The National President, NEYPEI, Alhaji Kyari Idris Abubakar had explained that the immediate confirmation of Magu would impact positively on the ongoing war against corruption by the present administration. Abubakar further explained that the commitment by Magu to revisit the trial of some former governors whose prosecution and trials were stalled by some technicalities, shows that the tenure of Magu as EFCC boss would bring more positive results in the fight against corruption and other crimes in the country. Dare not Magu. Within a short while as EFCC Chairman, Magu had secured more than 140 convictions and recovered billions of dollars in stolen funds from unscrupulous individuals. Indeed, like Nuhu Ribadu, Magu is legendary Nigerians believe he has the pedigree to champion a new course for President Buhari’s fight against corruption in the country.